From beloved author Sue Macy comes an illustrated biography of Mary Garber, one of the first female sports journalists in American history! Mary Garber was a pioneering sports journalist in a time where women were rarely a part of the newspaper business. Women weren't even allowed to sit in the press boxes at sporting events, so Mary was forced to sit with the coaches' wives. But that didn't stop her. In a time when African-American sports were not routinely covered, Mary went to the games and wrote about them. Garber was a sportswriter for fifty-six years and was the first woman to receive the Associated Press Sports Editors' Red Smith Award, presented for major contributions in sports journalism. And now, every year the Association of Women in Sports Media presents the Mary Garber Pioneer Award in her honor to a role model for women in sports media. 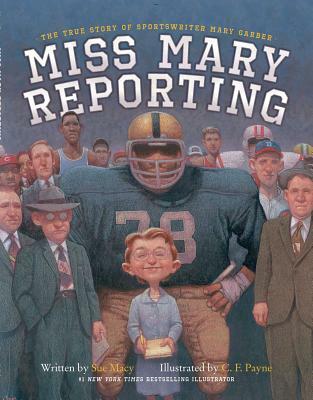 Sure to inspire future journalists, athletes, and any child who has a dream, this illustrated biography of Mary Garber captures her feisty and determined spirit and brings her story to life.